Home > Automotive Belts > Automotive Serpentine Belts. 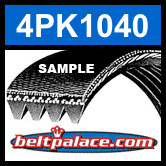 PK, K Section Poly V > 4PK1040 Automotive Serpentine (Micro-V) Belt: 1040mm x 4 ribs. 1040mm Effective Length. 4PK1040 Automotive Serpentine (Micro-V) Belt: 1040mm x 4 ribs. 1040mm Effective Length. 4PK1040 Serpentine Belt: 1040mm x 4 ribs. HEAVY DUTY Automotive Serpentine Belts (EPDM): PK (K) Section. Metric 4PK1040 Serpentine Belt. 1040mm Effective Length, 4 Ribs. BANDO USA “PK” Premium Series Automotive Serpentine (Micro V) ribbed belts are designed to replace OEM belts on extra heavy-duty passenger car and truck applications: 4PK1040 Serpentine Belt. BELT 4PK1040: 4 Rib belt from SLP Performance Underdrive Balancer Pulley Kit for 2004 Corvette, et al. 6PK1900 Automotive Serpentine (Micro-V) Belt: 1900mm x 6 ribs. 1900mm Effective Length. 6PK1900 Automotive Serpentine (Micro-V) Belt: 1900mm x 6 ribs PK (K) Section. Metric 6PK1900 Serpentine Belt. 1900mm Effective Length, 6 Ribs. 6PK1040 Automotive Serpentine (Micro-V) Belt: 1040mm x 6 ribs PK (K) Section. Metric 6PK1040 Serpentine Belt. 1040mm Effective Length, 6 Ribs.